The barrow can be seen as the slight mound on top of the chalk face. View from the quarry floor. 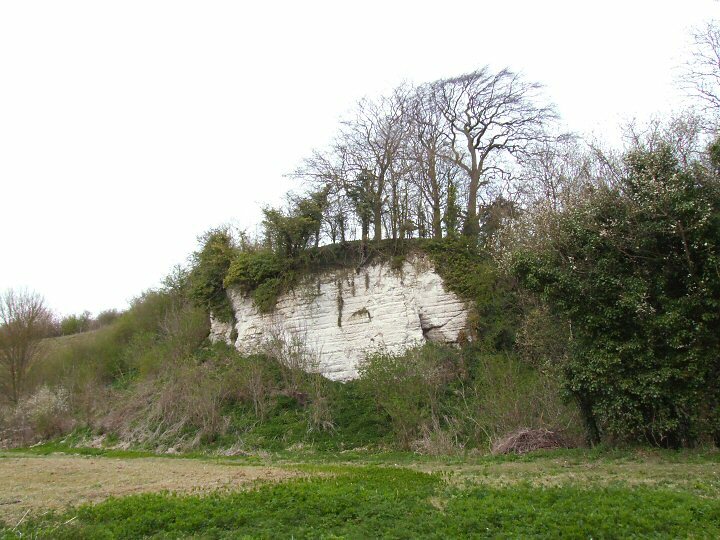 This must be one of the strangest locations for a round barrow anywhere in Lincolnshire - it is perched on top of a 10 metre block of chalk overlooking a nature reserve. When one realizes that the nature reserve was formally a quarry with the chalk extracted and burned to make agricultural lime things start to make more sense. It was during the quarrying of this chalk around the base of the barrow in the early 20th century that a crouched skeleton and a beaker pot was discovered. This pot is said to have rolled down the side of the cut and was subsequently damaged, it was later dated to around 1600BC. Whether it was decided not to continue quarrying under the barrow for archaeological reasons or because the quarrymen were superstitious about disturbing any more bodies is not known but the skeleton that was recovered was later buried in Claxby churchyard. What remains of the barrow itself measures about 15 metres in diameter, stands a little over a metre in height and is situated on a northwest-southeast spur of land overlooking the valley of Burlands Beck. This spur is also the location of two of the three remaining Neolithic long barrows of the Deadmen's Graves group which stand about 500 metres to the northwest. This part of Lincolnshire is an area where nothing much seems to change over large spans of time and it could be that Mill Hill barrow and Deadmen's Graves were used and venerated by the decedents of the same family group, indeed the Bronze Age bones now buried in the Christian churchyard of Claxby could be related to those buried under the Neolithic mounds of Deadmen's Graves. 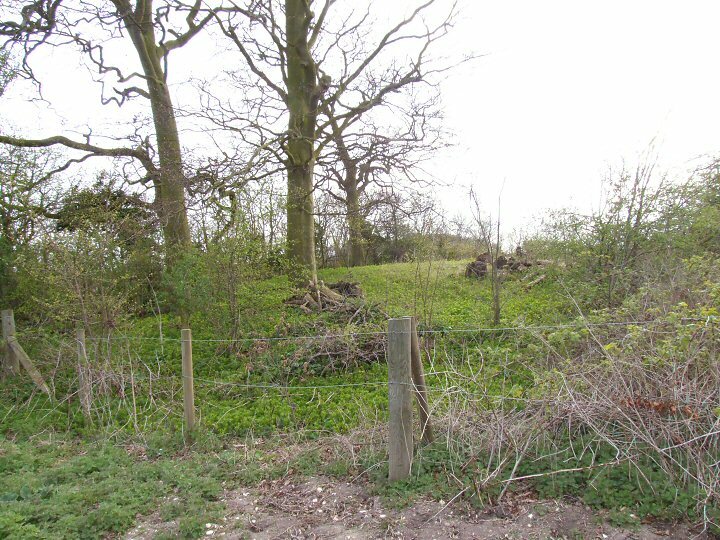 Close view of the eastern side of the barrow from the edge of the field above the disused quarry. The fence is there for good reason - see photograph at the top of the page.